Photo by somebody_ from the Torontoist Flickr Pool. We’ve been following Metrolinx’s Georgetown South Service Expansion and Union Pearson Rail Link project (GSSE/UPRL) since the beginning of the summer. For those unfamiliar, GSSE/UPRL is a major transit initiative that will result in the addition of several new sets of tracks to the rail corridor between Union Station and Malton for freight and commuter use. That’s the GSSE part. The other part of the project, the UPRL, is exactly what it sounds like: a new rail link between Union Station and Pearson Airport (to be operated for profit by a private carrier). The reason we’ve been paying so much attention to this project is that it has been fraught with controversy for months—controversy that is now poised to come to a head. Opposition to the GSSE/UPRL project originated with individuals and community groups from the many neighborhoods along the rail corridor in question. These entities united under the common banner of an organization known as The Clean Train Coalition, just in time to use what remained of the project’s provincially mandated, 120-day public comment period to wage what has been, by all accounts, a concerted and effective campaign against some of the plan’s less desirable aspects. The Clean Train Coalition’s main bone of contention with GSSE/UPRL has always been the fact that all the locomotives riding the new rails—on opening day, nearly seven times as many as before, by Metrolinx’s own estimates—will be exclusively diesel-burning, as opposed to electric. 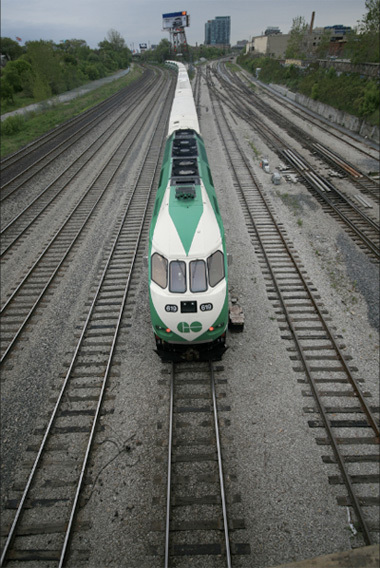 From its inception, the group claimed that these new trains would pollute the air around the tracks with harmful chemicals from diesel exhaust and that the only solution was for Metrolinx to agree to immediately “Go Electric.” Metrolinx (which, to its credit, did carefully review all public input throughout the public consultation process) responded that doing so would be costly and time-consuming, that the rail service improvements could not be delayed, and that, in any case, they had always been planning on electrifying the lines as part of their fifteen-year plan. The Coalition, unsatisfied, wrote a protest song we still can’t get out of our heads, spearheaded a letter-writing campaign, held press conferences, attended community meetings with Metrolinx brass, and even wheeled their children into Queen’s Park so the media could see the tiny lungs that would be forced to inhale the diesel exhaust. Metrolinx agreed to launch a study of electrification (they did this after the song, but before the stroller parade), but has never considered immediate electrification. A map of the rail corridor. Rendering courtesy of Metrolinx. Presently, the anti-diesel campaign is at a crucial junction on its long chug-a-lug to a conclusion, because the GSSE/UPRL project’s 120-day public comment period ended last Friday. This means that Metrolinx is no longer obligated to entertain public input. The project is currently in the midst of a 30-day public review period, after which its fate will be in the hands of Ontario’s Minister of the Environment, who will have a scant thirty-five days to review objections to the plan and decide whether or not it can go ahead as-is. The Minister can refer the project for further consideration, or he can approve it without further conditions. If the plan is approved, and it also passes its concurrent federal environmental assessment, the result will be diesel trains for the west end of the GTA and lots of them. The other interesting thing to come out of the conclusion of the GSSE/UPRL project’s public comment period is Metrolinx’s final Environmental Project Report. This report is required by the Ontario Transit Project Assessment Process (to which GSSE/UPRL is beholden), and it contains detailed information on projected levels of most of the pollutants protesters are concerned about. The short version is this: the environmental consulting firms hired by Metrolinx to carry out air quality and human health evaluations are of the opinion that while, yes, more diesel locomotives will mean significantly more airborne pollutants from diesel exhaust, these chemicals will, in almost every case, remain below federally and provincially set threshold levels for human safety. They say their assessments are based on worst-case scenarios, drawn from the most polluted points along the corridor. Photo by Tony Lea (Computer Crashed. No Flickr ’til Friday) from the Torontoist Flickr Pool. The few chemicals that will exceed safety thresholds, the environmental consultants say, would still be excessively concentrated in the air around the tracks with or without the additional trains. Also, these excess concentrations will only be present in particularly vulnerable locations and on particularly bad days, when background concentrations from other sources contribute to the total. The consultants also say that only sensitive individuals (including asthmatics and children) will be at risk for acute effects like wheezing and respiratory disease, that the risk will be minimal, and that the exhaust fumes will have virtually no effect on air quality in locations more than three-hundred metres away from the tracks. Beyond that distance, the new smog will simply blend with the old smog, for a negligible contribution to an already compromised atmosphere. Notably, the consulting firms were unable to study one particular type of exhaust-borne pollutant, ultrafine particulate matter (basically very, very, very small grains of soot), because no established scientific method exists for doing so. Maybe next time? More commuter and freight trains in the GTA are clearly a public good, but smog—even an allegedly acceptable level of smog—clearly is not. 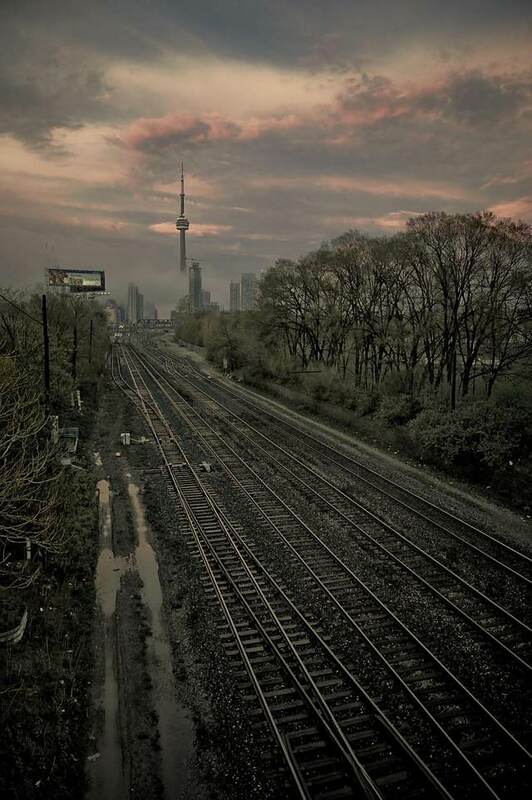 Those of us living more than three hundred metres away from the tracks can dispassionately weigh the pros and cons of the situation, but for those whose lungs, and whose children’s lungs, are on the line, things aren’t as simple. Most harmful pollutants will double, greenhouse gas emissions will increase. Such groups as the Toronto District School Board, the Toronto Board of Health, Canadian Association of Physicians for the Environment, Toronto Environmental Alliance and others agree that this project will cause harm to an already poor and unhealthy part of Toronto. In approximately two months, we find out if the province considers these objections sufficient reason to jeopardize a tight train schedule. 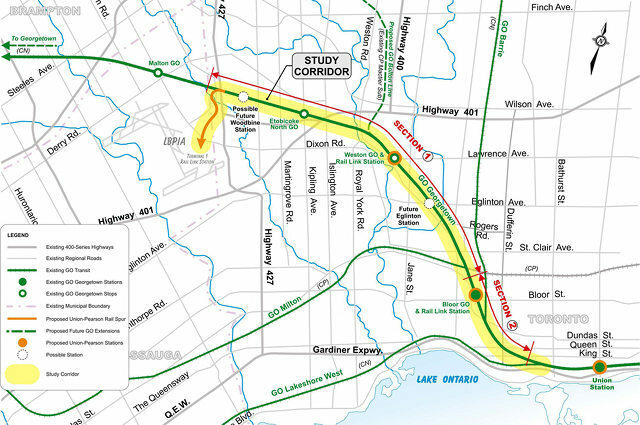 The GSSE/UPRL project is only the first of many slated for completion under Metrolinx’s twenty-five year, $50 billion regional transit plan, meaning that additional delay and cost related to GSSE/UPRL might have undesirable ramifications for subsequent projects. These additional airborne pollutants might not be concentrated enough to alarm environmental officials, but if it was our lungs? Our family’s lungs? We’d be worried, too. CORRECTION: AUGUST 10, 2009 This article originally stated that the Georgetown South Service Expansion and Union Pearson Rail Link project “is now in the hands of Ontario’s Minister of the Environment, who has a scant thirty more days to review objections to the plan and decide whether or not it can go ahead as-is”; in fact, it is currently in the middle of a thirty-day review process, and it will go to the Ministry of the Environment for a final decision only after that process ends.